Children instantly infuse a house with warmth and energy, however these days, with our fast and hectic way of living, we often communicate poorly with our kids. Within every nook and cranny of a house, we should ensure the architecture is suitable and comfortable for family life. 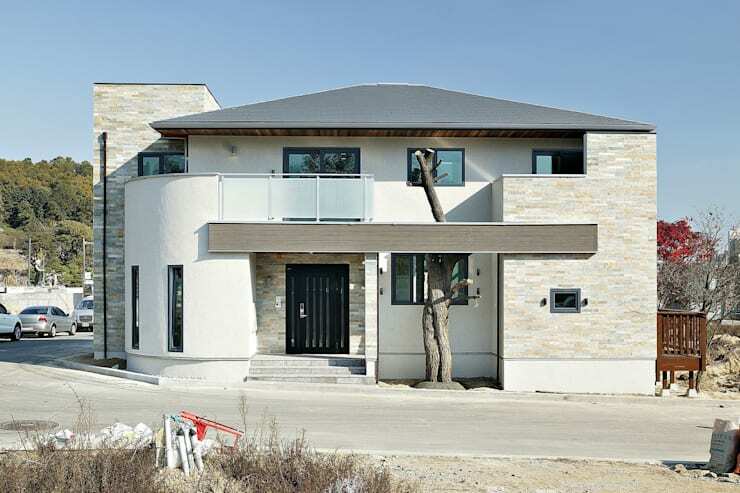 Today on homify we are travelling to Korea to check out a dwelling that connects wonderfully with both children and adults alike. 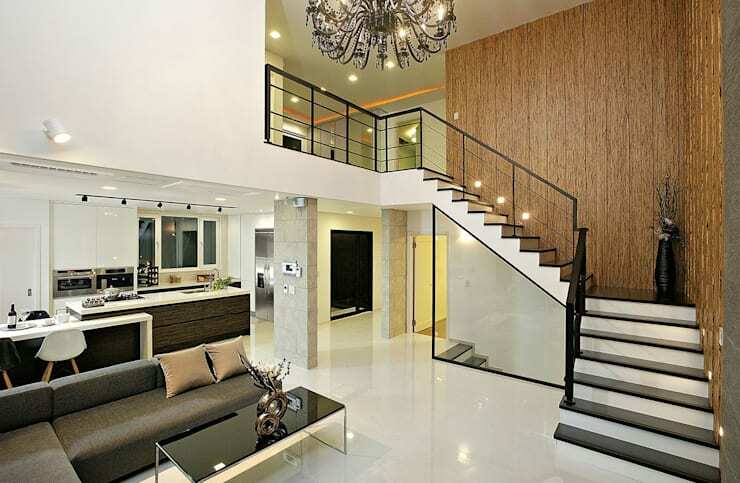 Here we present to you a single-family home that has been named 'Zen House' for its sympathetic design and form. Parents will undoubtedly agree that every moment spent together is precious. From simply acknowledging the presence of little ones, a space can be transformed into a cosy and enjoyable home. Additionally, children will understand the ambience and atmosphere and enjoy the feeling of love and protection from their parents. The clients are a couple with three children and required a space that featured a family-friendly living room and kitchen. 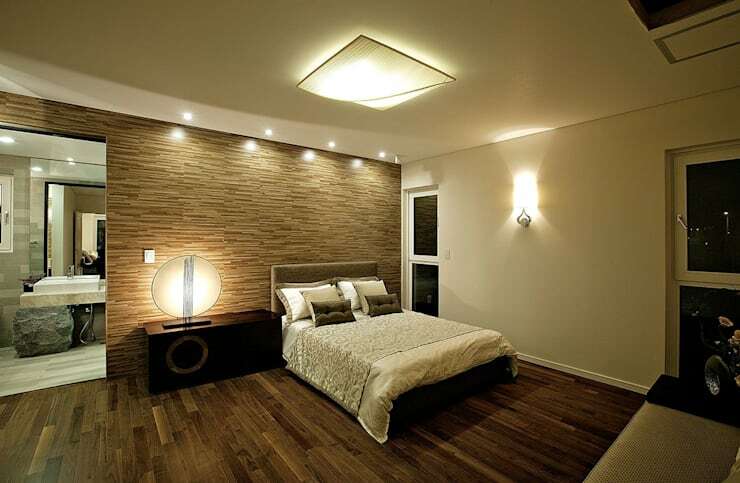 Moreover, they wished to have all of the bedroom spaces communicate with each other and create an easy domestic flow. A final consideration was that the family are naturally inclined to gather in one place, even if scattered within that particular living zone. The home therefore features individual spaces that are linked, and create attention-grabbing areas and rooms. 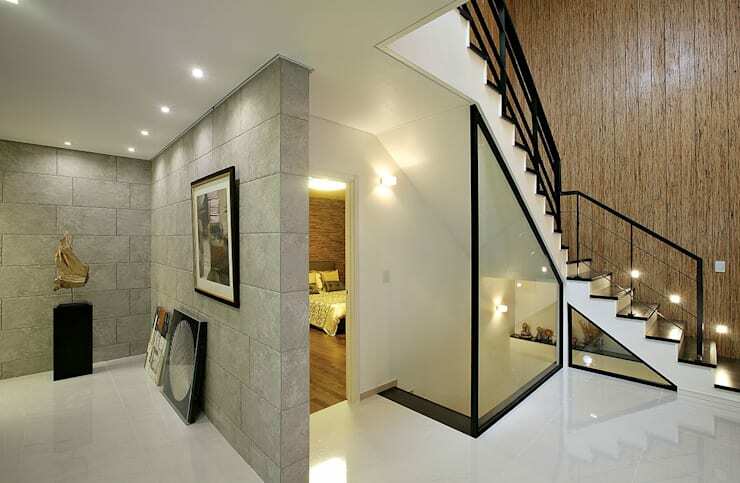 Zen House brings the whole family together, and provides a warm and intimate domestic design. Design and construction undertaken by Oua Architects Group in South Korea. Here we are presented with the home's façade, which faces the North Road. Multiple windows provide illumination, with a feature piece of timber that is blocked by stone walls, which from the outside naturally block the view onto the balcony. The main colours are neutral hues, with a refined blend of straight and curved lines. Additionally, the home embodies a modern feel, with an elegant appearance. As we enter through the front door we are met by a closed and solid wall. This area is a special space for art, and seems to intentionally offer a long front porch that evokes the sense of visiting a gallery. This is a truly luxurious and enjoyable space. The wall is replete with a chic grey colour, which exudes elegance. The surprising construction is lightweight, helped by the illumination of spotlights that feel soft against the white stone floor. This eye-catching space is graceful and endearing, while offering a delicate, colourful, and simple gallery entrance. Three children demand a large and open space to play and live. Here in this room there is a void that provides a view to anywhere within the living area. This ensures the parents can look around the room and secure a wide field of view both upstairs and down. The second floor is essentially half of the first floor, and is connected to the other level via an open void staircase. Through the void, the parents can ensure their children are always in view when on the second floor, and allow the children to share both the living room and kitchen. Here we see the living room that has been constructed side-by-side the kitchen. The one-piece kitchen island leads from the cooking space and faces the living room. 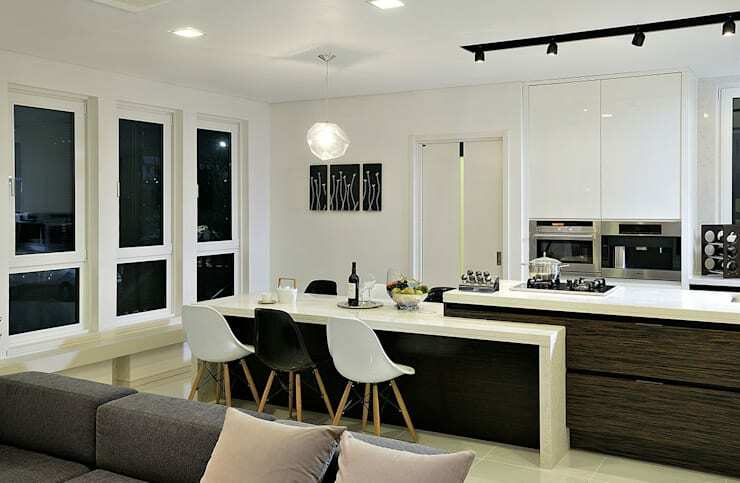 This multi-purpose zone ensures the kitchen and dining are infused together, maximising family-friendliness. The dining area comes replete with an informal breakfast bar that can be used as a studying/homework space for the children while a parent is watching over them in the kitchen. This room ensures food is shared and that families are able to spend time together in the living room with a parent in the kitchen at the same time. The room features a sense of undisturbed calmness and is one of three main spaces. The living room and kitchen furniture were generally installed lower, with the long dining table horizontal. This creates a naturally interwoven area focusing one's eye into each space. Colour and decoration are refrained, and worktops are sleek. The underside of the table is fitted with a natural veneer in a deep tone, and adds a sense of security, as well as visual beauty. The second floor of the home provides a large landing for the three small children to play. This centre area has been used as a place for the kids to hang out and provides a small clean space that can be used for the children and their friends to gather, while the parents are in the living room. This domestic area is also within sight of any adults on the ground floor, first floor and second floor, adding to the flow of communication seen throughout the dwelling. In the basement is a guest room for visitors. However, when not being utilised by guests, there is a multi-room configuration that allows the family to gather and enjoy a workout or game. The décor and furniture is limited to absolute minimum, and is placed to provide full illumination from the lights. The room is a calm, yet modern American designed space that takes advantage of small spaces. 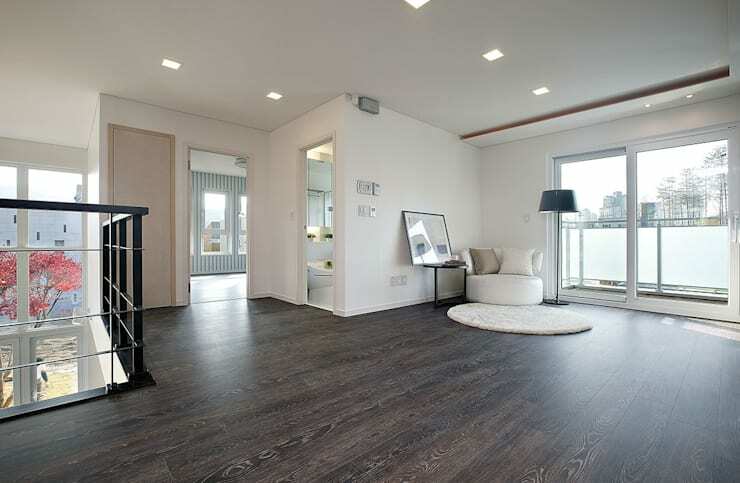 The floor that has been added imparts an interesting hue within the room, and the grey tinged timber composite is scratch resistant for tough usage. The master bedroom prioritises sleep and calm restfulness. Furniture is minimal and the colour was employed to match a variety of grey and brown tone, which produce a soft atmosphere and ambience. The décor is bright with ceiling lights installed to add illumination. Colourful lights join and mingle at different angles, and represent a three-dimensional space. 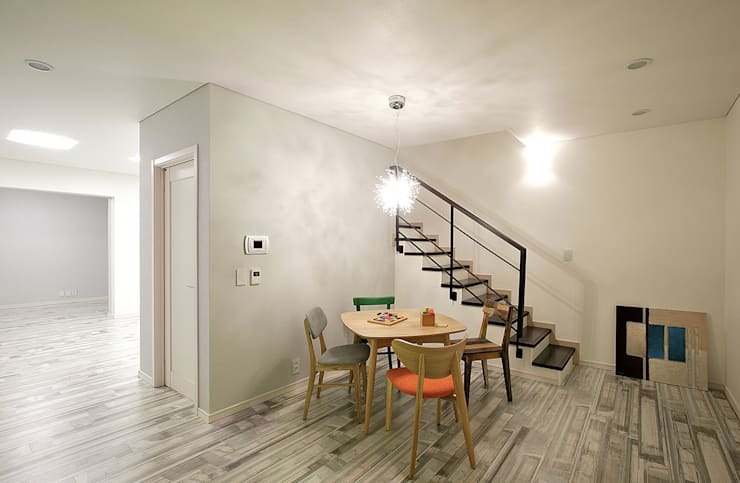 Simple timber floors and walls add a warm and cosy feeling that immediately seems to relieve the body of stress. If the master bedroom is quiet and cosy, then the children's room is full of youthful vitality and tranquillity. The lighting is bright, crisp and focused to the centre of the wall. 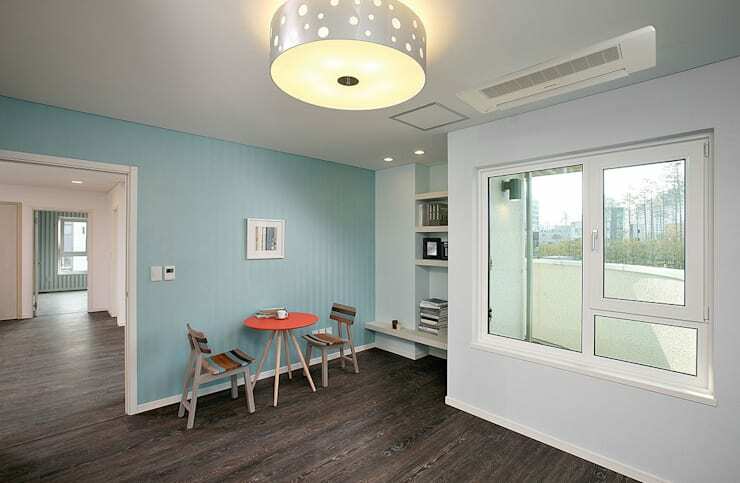 This feature wall is painted with a clear turquoise hue, adding a serene aesthetic. Dark brown timber floors contrast with the overall white colour scheme, and gives children an area that is calm, relaxing, playful, and yet still boasts an ambience of security.